Complete, practical coverage of the evaluation, analysis, and design and code requirements of seismic isolation systems. Based on the concept of reducing seismic demand rather than increasing the earthquake resistance capacity of structures, seismic isolation is a surprisingly simple approach to earthquake protection. However, proper application of this technology within complex seismic design code requirements is both complicated and difficult. Design of Seismic Isolated Structures provides complete, up-to-date coverage of seismic isolation, complete with a systematic development of concepts in theory and practical application supplemented by numerical examples. 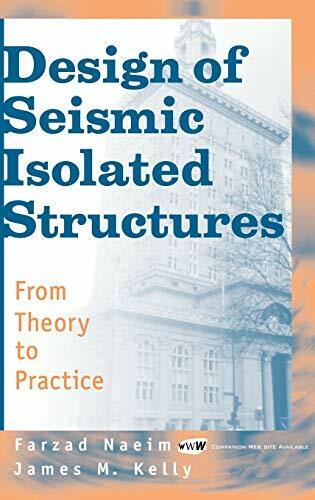 This book helps design professionals navigate and understand the ideas and procedures involved in the analysis, design, and development of specifications for seismic isolated structures. It also provides a framework for satisfying code requirements while retaining the favorable cost-effective and damage control aspects of this new technology. An indispensable resource for practicing and aspiring engineers and architects, Design of Seismic Isolated Structures includes: Isolation system components. Complete coverage of code provisions for seismic isolation. Mechanical characteristics and modeling of isolators. Buckling and stability of elastomeric isolators. Examples of seismic isolation designs. Specifications for the design, manufacture, and testing of isolation devices. FARZAD NAEIM, PhD, SE, is Director of Research and Development at John A. Martin Associates, Inc. in Los Angeles, California. JAMES M. KELLY, PhD, is Professor in the Graduate School of the University of California at Berkeley. Naeim, Farzad; Kelly, James M.